Audio over IP does not need to be complicated or expensive. With the DARC Surface, you can control any Dante network audio source. 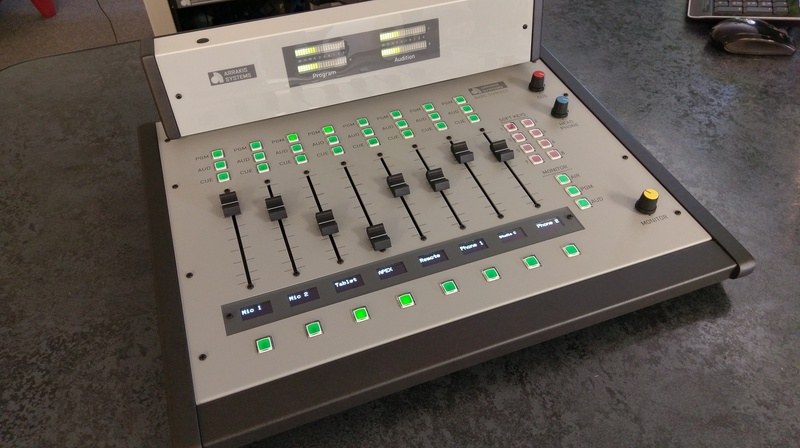 Mix, adjust levels, everything you need for an On-Air or production room console. A Digital AoIP Console designed for you. Designed to be easy to setup, and use. Yet flexible and powerful for your needs today, and tomorrow. 8, 12 or 16 input channels. 8, 12 or 16 Channel Models. DARC Surface comes in 3 different models depending on the number of channels that you need. This means that you can choose what size best fit your needs. Whether the 8 with its small profile yet powerful design, or the 16, with all the faders you could ever need. DARC Virtual Console Software. The DARC Virtual Software comes included in the package deals. The DARC Surface works in harmony with the DARC Virtual Console software. Simple IP. The DARC Surface, along with the DARC Virtual Console, will work with any Dante enabled device on your network. This includes our Simple IP units, which can have either Analog or Digital Inputs & Outputs. Learn more. Programmable Inputs & Outputs. Control anywhere in the world. The DARC Surface is a Digital AoIP console. Being digital means that your audio is handled digitally, and there is no signal degradation within the board. It is protected from RF, and is very flexible. Being AoIP means that the DARC Surface has access to any audio input or output on your Dante local network. Quickly select your inputs and outputs via the DARC Virtual Console software. OR swap assignments via the 4 programmable buttons on the DARC Surface. Being Windows based, you can also use any remote control app to control your board anywhere in the world with an internet connection. The DARC Surface is the ultimate in power, flexibility and value. OLED Displays. The DARC Surface utilizes long life OLED displays. These displays show what source channels have been selected for each channel. These OLED displays are high contrast, easy to read and beautiful to match. LED VU Meters. Complimenting the DARC Surface, we gave it two pairs of bright, 20 segment stereo bargraph LED VU Meters. These meters have an extremely long life span utilizing the latest in LED technology. LED Switches. Momentary switches are 5 million operation & LED illuminated, for an extremely long life. No more need to replace switches or bulbs. Compartmentalized. The DARC-Surface is sleekly designed with its compartmentalized design. All of your audio input and output wiring goes to your Simple IP units, while the DARC has limited wiring to make your studio stylish and functional. The DARC Surface is a pure digital control surface. All audio inputs & outputs are connected through the Simple IP Surface. And all audio is mixed via a Windows PC and the DARC Virtual software. The DARC Surface is simple a physical control surface that gives you control over the DARC Virtual software. Installing the DARC Surface is quick and easy. The only connections on the DARC Surface are a USB and an RJ45 for the DARC Surface LED Meter input. ▪ 1 to 16 Mic channels. Your choice, your configuration. Simply connect your mics to the Simple IP inputs. Each Simple IP box allows you to connect up to 4 mic channels. Channels are software assignable. ▪ Mic Pre Needed. Simple IP are all high level stereo inputs. Mic channels require an external mic preamp with mono to stereo wiring. ▪ Mic Monitor Mute. Mic channels will automatically mute the monitor output when activated. ▪ 1 to 16 Inputs. Software assignable line inputs. Simply connect your audio source outputs to the Simple IP inputs. Each Simple IP box allows you to connect up to 4 Stereo Line inputs. ▪ Analog or Digital. Choose to use either analog RJ45 inputs with the Simple-IP-8A or Digital XLR AES3 inputs with the SImple-IP-8D. ▪ +4dBu or -10dBu analog inputs. Simple-IP-8A is jumper selectable between balanced +4dBu and unbalanced -10dBu inputs. ▪ Phone channel. 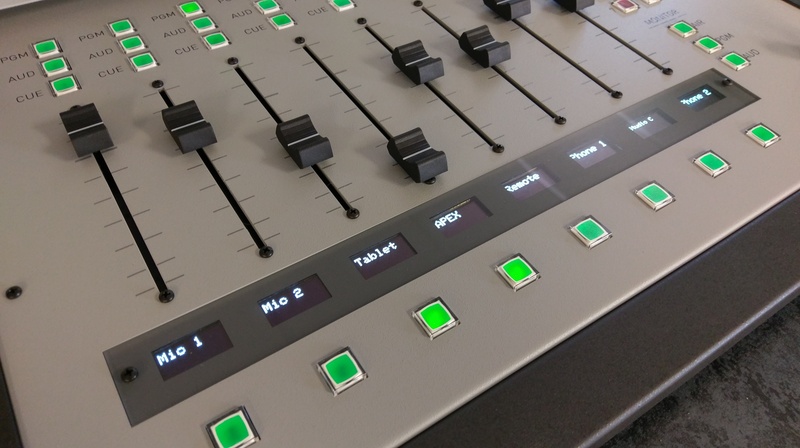 Within the DARC software, choose to assign one of your I/O on the Simple IP to a phone mix-minus to connect to your phone hybrid. ▪ Mix-Minus. Once a channel has been assigned as a Phone channel in the software, it will configure to audio to work with your phone hybrid. ▪ Talkback. With the Phone channel setup, the first mic channel will have a Talkback function that allows you to talk to the caller off line. ▪ 2 Logic Output. As an optional add-on, add logic outputs to the DARC family. This USB logic output connects to your PC, and is controlled via the DARC Virtual Console software. This is programmable to turn on On-Air Lights, trigger phone hybrids, etc... This option gives you 2 relay outputs. ▪ 8 Logic Output. 2 outputs not enough? Get the 8 logic output USB control instead. ▪ PGM, AUD. DARC can assign output control to any output on your Dante network. This may be one of our Simple IP units, which has 4 stereo outputs per box. ▪ Monitor, Cue & Headphone outputs. 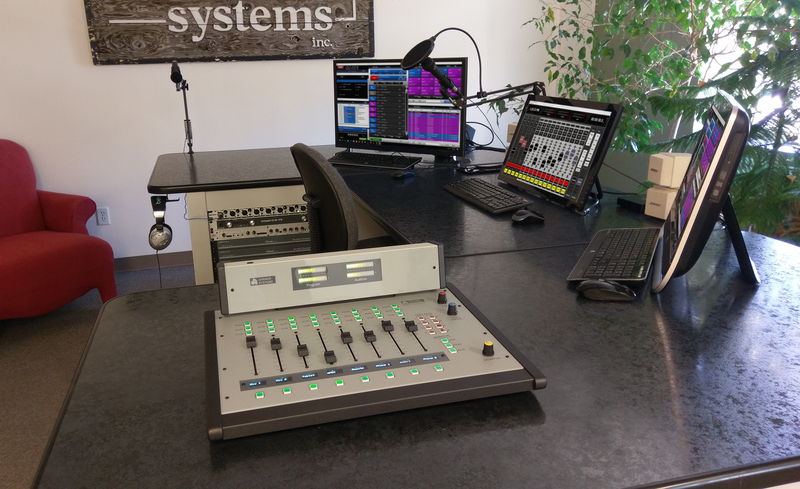 Utilize the Cue function built in to the DARC software to play audio off-air through your monitor, cue or headphones. Monitor, Cue and Headphones all connect to your Simple IP unit. ▪ Mic Monitor Mute. Mic channels will automatically mute the monitor output and play audio through the headphones when activated. Talk back audio plays through headphones as well. DARC Surface is a digital surface and does not have audio run through it. It is therefore a pure signal and RF free. All Stereo inputs and outputs on the Simple IP are also balanced for RF resistance. The DARC Virtual Console comes standard with DARC Surface bundle packages. This gives you tons of additional features at your fingertips. Remote control from anywhere in the world. Analog or Digital Audio Inputs and Outputs. (1) Dante Audio Source - You need to connect your audio sources, such as your microphones, headphones, phone systems, automation, etc..., to the Dante audio network. You can do this using the Simple IP analog or digital nodes, Dante AVIO adapters, Dante Virtual Sound Card, or any other Dante enabled device. Once your device(s) is connected to the Dante network, this step is complete. (2) DARC Virtual software - Then all you need is the DARC Virtual console software ran on a Windows PC (not included). This software is designed to recognize Dante devices on your Local Area Network (LAN), and then gives you the ability to control any of these devices. Optional - You can now connect other optional equipment to your Dante network to expand your setup as necessary. Whether you want to use a physical control surface such as the DARC Surface, or add more equipment to your Dante AoIP network such as Simple IP. It is all expandable to as large as you want or need. DARC Surface. Digital Console. Flexible and powerful. LED Meters - two pairs of bright, 20 segment stereo bargraph LED VU Meters. balanced inputs & outputs which excel in high RF environments. OLED Displays - each channel has a dedicated high resolution OLED display. This shows what source is currently selected on the channel. Remote Control from Anywhere. Connect and Control. Windows Based - Any remote access software is capable of controlling your DARC unit. This means that you can turn channels on/off, control volume, etc, from anywhere you have an internet connection. Whether from your phone, your home PC, you are in control. Dante & AES67. AoIP done right. Dante - DARC Surface utilizes the Dante audio networking protocol. This protocol has hundreds of manufacturers, and is world recognized. AES67 - Dante utilizes AES67, which allows you to connect any AES67 enabled device. Dante Virtual Soundcard - The Dante Virtual Sound card is included in the price, and enables you to put ASIO sources from your PC to the Dante network. Dante Controller - Is a free software from Dante, that allows you to route input and output audio on your Dante local network. Dante AVIO- The Dante AVIO hardware are extremely affordable input and output adapters. Quickly and easily connect any analog or digital hardware device, and stream the audio to the Dante network. 2 Stereo output buses. Program & Audition with mono mixdowns. Active balanced - All outputs & inputs are active balanced on Simple IP hardware. Stereo or Mono - Both stereo & mono outputs for 2 output buses on Simple IP hardware. Listen - Monitor, Cue & Headphone output to cue and talk to callers off air. 3 types of Inputs. More options, more power. 1 - 16 Mic Channel - Your choice, your configuration. Simply connect your mics to the Simple IP inputs. Each Simple IP box allows you to connect up to 4 mic channels. Channels are software assignable. Stereo Line level Channel - Using Simple IP, the stereo input channels are appropriate for source devices like CD players, MP3 players, network feeds, etc. With balanced inputs, it allows you to safely connect to sources, that are originated in other studios, where the long wiring could introduce hum & noise. Telephone Channel - Easily connect to an external telephone hybrid using Simple IP. The caller can talk to you through the Cue system while a 'Push to Talk' button in the software enables the first mic to talk off-line to the caller. Phone line system. Connect your phone hybrid to Simple IP for a powerful phone system. Phone Channel - dedicate a channel to easily connects to an external telephone hybrid. Analog RJ45 or Digital XLR. Flexible for you. Simple IP 8A - Has RJ45 analog inputs and outputs. Simple IP 8D - Has XLR, AES3 digital inputs and outputs. Windows & Touchscreen Compatible. DARC Virtual Console. Windows - DARC Virtual Console works with the Windows OS. See the support page to view the required specs. Touchscreen - Use any Windows OS based touchcreen with the DARC Virtual Console. DARC is specifically designed to be easy to use with touchscreens. Need audio over IP? Simple-IP is the solution. Connect any analog or digital audio sources to Simple-IP putting your boards on the Dante network This simple and reliable solution will save you time and money. Quickly connect any analog or digital audio source to play into a Dante audio network, at an extremely affordable price. Purchase a fully configured Dell Optiplex Micro from us. This PC will be ready for use out of the box to work with the DARC Virtual Console software. It will be ran in Kiosk mode and dedicated to the DARC Virtual Software for optimal reliability. 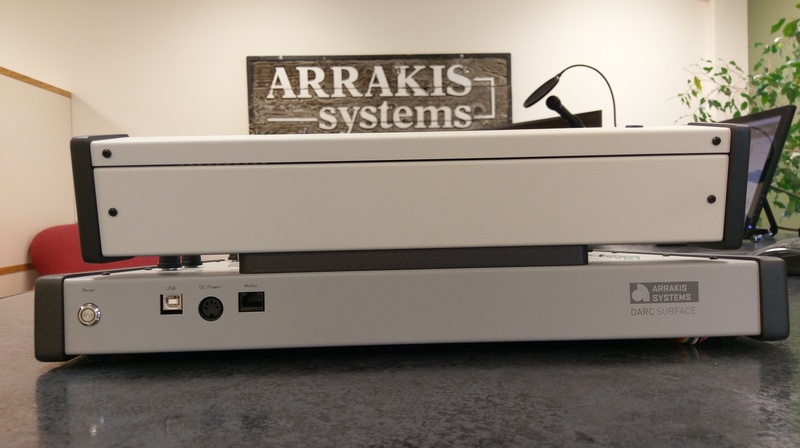 To qualify for software support for DARC, you must purchase a configured PC from us. Learn more on our support page.